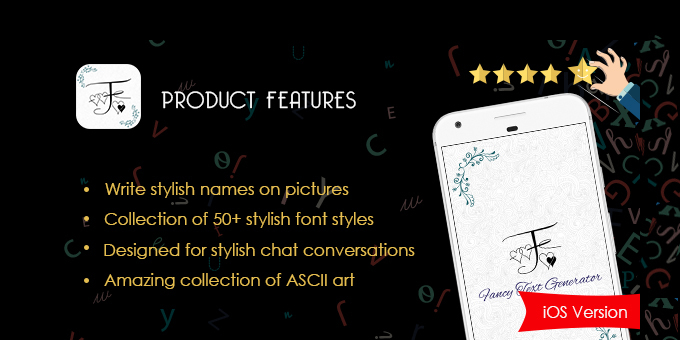 Stylish & Fancy Text Generator is very simple & easy to use with add-on features of adding stickers, decorative patterns & ASCII art designs to stylish fonts. With this app, you can decorate your text by choosing from different font styles, copy them to your clipboard & share on social media chat conversations. Apart from fancy text, you can also use fancy name art for writing your names on gallery or camera pictures and further decorating them with stylish designs & patterns. Fancy Text Generator is developed in Objective C and using Xcode 8.0 or above. The deployment target for the app is above 8.0 OS Version.